The Highlander (Hybrid): a difficult-to-master, but hard-hitting Viking. This unique character can switch between two stances, Offensive and Defensive, as they wield a mighty claymore. The Gladiator (Assassin): an easy-to-play Knight who boasts a high attack speed. They excel when it comes to stamina management and easily keep enemies at a distance with their proud tridents. The Sentinel (Knight-themed map): all that remains of a once-proud fortress is its cliffside watchtower. Keep an eye out for functional ballista placements among the ruins. This map is available in all game modes. The Viking Village (Viking-themed map): has long been deserted, but the mead hall at the top of the main street can still get pretty rowdy…if you know which lever to pull. This map is available in all game modes except Dominion. Trap doors during Duels no longer open at match start, they are triggered at 25 seconds. Duel location on broken bridge has been altered to include larger fighting space. Duel location on balcony catwalk now has full railing along the lookout view. Duel location at top of tower has been removed and moved to lower garden area. Duel location on bridge has been removed and moved to lower area. We are introducing the Ranked Duel Tournament feature in Beta. Tournament: Join a tournament and play 3 to 6 Ranked 1v1 Duel matches through qualifiers and playoffs. Tournament specific rewards are available based on your Duel Tournament progression. Ranking: Every Tournament match will have an impact on your Player Rank. Players need to complete 20 placement matches to get an official Ranking. The “Anti Run Away” system works by tracking characters’ navigation to identify who is running away and who is in pursuit. If the system confirms that a player has been running away for too long, it applies different boosts and penalties to the duelists. 4 new Legendary weapon visual have been added for all heroes. 2 Legendary armor variations also given to all heroes except Highlander and Gladiator, while 1 Legendary armor variation has been added for Highlander and Gladiator. New Legendary Gear Stats for weapons also added, exceeding previous maximums for both bonus and penalties. 36 new Stat Bundles for weapon added for legendary with gear. Legendary gear can now be looted from Reputation 7. The Hero menu now preview Executions, Emotes and Mood Effects in real time in-game animations instead of videos. 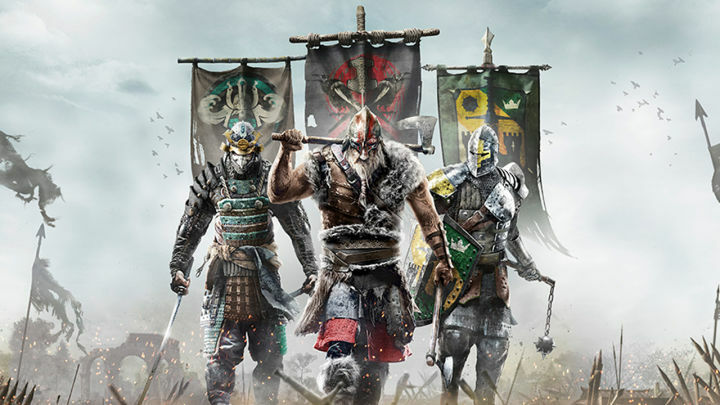 The War Banner has been added to the Faction War functionality. Selecting a territory with the War Banner will send all generated War Assets to this territory, until it is manually removed or the territory becomes unavailable for deployment after a territory update. The War Banner can be placed on the Faction War map before, or between, matches. Matchmaking will now restart automatically if there’s not enough players to start another match once the end of match lobby countdown reaches 0. As an additional improvement, groups will now be kept together when this occurs. No more kick back to the Main Menu or Group Disband!